It’s chaotic inside of me, as someone close is suffering. It affects me, as a lot of thoughts pop into my mind, about the fate and future of this one soul; what I can do, or not do; thought on a society that has let the rights of a few be more important than the needs of the many. This makes me weary. Lacking in energy. It’s as if I’ve grown lackluster, myself. I am ever grateful that I’ve learned to be gentle towards myself, and to let myself be, in a situation as this, rather than push hard and beat myself up for not living up to the highest possible standards (mine, that is). Because I have a hard time to focus, truth me told. So I retreat, after doing what I am capable of doing workwise, and then… I knit. 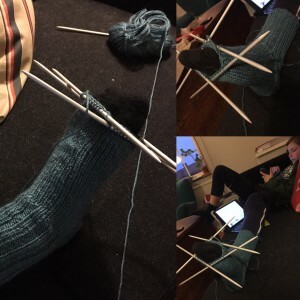 With an unfinished sock in my hands, the gentle click clack of the knitting needles, and the tendency to get sore fingers from the slightly coarse organic wool/nettle-yarn, that I so love, my mind is free to simply be. No demands. No expectations. To be let off the hook of accomplishments and deadlines, I revert to maker-mode and rejuvenate. If it was warmer outside, I might be putting my hands into soil, cultivating my garden, but given a few degrees plus, rain and fog-filled grey days with gusts of wind that cut to the bone, I stay inside, my fingers find a similar sense of satisfaction in turning the yarn into a thing, a creation, something that can be used, providing warmth and beauty both. I know. It will not last forever. Something will give, the situation will resolve itself, somehow – and I pray for it to turn out as best it can – and I will revert to my normal level of energy and accomplishment. In the meantime, I settle into the couch, throw a woolen blanket over my legs, and pick up the knitting needles, click clacking myself into peace of mind.